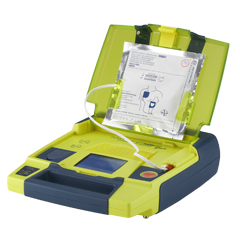 The Powerheart AED G3 Pro is a fully equipped automated external defibrillator (AED) aimed at medical professionals that want an AED with a ECG screen and manual override capability (it also has optional 3-lead ECG monitoring as well as Rechargeable battery).. Calculates electrical impedance and if subsequent shocks are necessary, our proprietary STAR biphasic technology escalates the energy to deliver therapy at an appropriate, higher level. The color ECG displays the victim’s heart rate, waveform, number of shocks delivered, and the elapsed rescue time — exactly what emergency workers need to know.